We can understand the most explicit definition of Darwinian deception techniques from the words of Joseph Goebbels, Minister of Propaganda for one of the 20th Century's most brutal dictators, Adolf Hitler. He was a Darwinist who carried out massacres inspired by Darwinism. This is the method which Darwinism uses for misleading people. Darwinisms lie has been told with a dogmatic sincerity so loudly and so often that without inquiring or investigating many people in the world thought that the theory of evolution was true. In addition although deceiving the masses on this issue is made by very clear, very public methods, nobody has been doubtful about those scientists who defend this lie, inclusion of this lie in science journals, and being taught in schools by placing it into the curriculum. These scientists came up with the lie that "the proteins coincidentally occurred in muddy water", and explained it again and again quite loudly, along with their supporters, almost like a scientific fact. They repeated these tales insistently to the people, who are unaware that the probability of a single protein occurring by chance is zero, and deceived them by creating almost a spell-like effect. 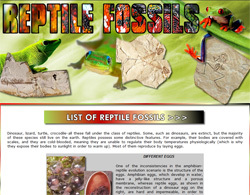 Darwinist scientists who defend the lie that "there are numerous transitional fossils" gave such a suggestion to the people who don't know the truth of fossil records that for many years, people thought that evolution was supported by a countless number of fossils. Moreover, under the influence of this strange indoctrination, people believed the lie that they evolved from apes, studied this at schools, and thought that their ancestors were strange-looking, hairy, ape-like creatures. People are conditioned to believe in these imaginary entities, as if they were real. Until the deciphering of Darwinist lies, people generally went along with the misconceptions of "Scientists tell the truth. 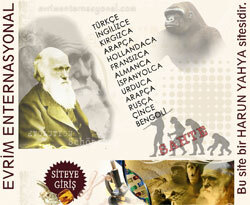 ", "We can not understand the issues of science, it is necessary to believe what scientists say. 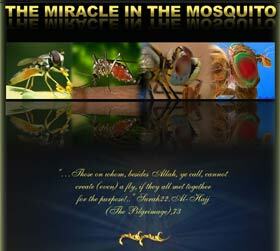 ", and people tended to believe what scientists said, and this ultimately established a distorted belief system. When the established system is anchored to this false assumption, the invalidity of evolution becomes a position that is no longer open to discussion. This is an important and a surprising fact: Darwinist scientists have been deceiving people since the time of Darwin. This system based on the delusion "Scientists tell the truth, what they say is indisputable." has led people to believe a lie, even live their whole lives according to these lies. 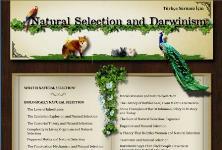 If the data does not match the lie of evolution, it was either concealed or destroyed. People have been clearly deceived and in a cruel fashion, people having thought that the information presented by the Darwinist scientists was authentic. 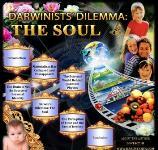 In the origins of Darwinism, there is an unconditional commitment to the materialist philosophy. 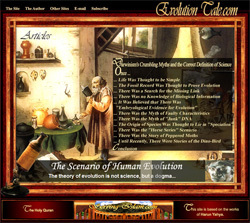 As materialism irrationally rejects all explanations about the origin of life and purpose of the existence of the universe except matter, without basing this on any scientific fact, and as the theory of evolution submits a false explanation for the emergence of life, there is thus a deeply-rooted connection between materialism and Darwinism. If attention is paid to the words of Lewontin, an important Darwinist obsession is revealed once again. Lewontin claims that "they had to defend evolution as they were on the side of science". However, when scientific facts are evaluated with a sincere and unprejudiced point of view, it is impossible for a person to defend Darwinism who claims that he is on the side of science. As usual, Darwinists lie and behave with the dogmaticattitude of "science equals to Darwinism", and thereby engrave this lie in people's subconscious. Darwinists thought that this deceit would always continue. But the existing situation is not what they had thought or expected. The materialist philosophy is in a state of collapse. 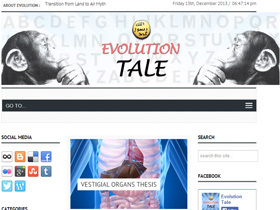 The lies, hoaxes, and subterfuge of the Darwinists were revealed one after another. People started to realize how they were forced to believe blindly in a false religion. 1. Darwinism and Materialism Try to Show That All of Life is "Simple"
Darwinisms' "enchantment" is predicated on getting people to avoid thinking. For this reason, Darwinists intensely distract the people whom they address with visual and aural inculcation. They are determined to distract people from reality by forming an enchantment effect. Many people give up thinking, examining, researching when confronted with these calculated indoctrination, and surrender to these supposedly scientific explanations which have been submitted to them. But the interesting thing is that this spectacle of indoctrination which distracts people and keeps them from thinking, in fact, basically harbors an irrational logic. Darwinist publications may explain the generation of a cell over hundreds of pages by using scientific and technological terms when what they want to say can be summed up quite briefly: Muddy water + coincidences + time = Life! 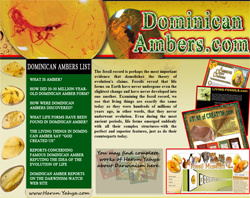 Sophisticated words, obtuse Latin definitions, technical and complex terminology is typically included in these publications to maximize the Darwinist indoctrination effect, However, there is absolutely no complex, subtle logic or explanation behind the Darwinist expressions. Many people who watch this explanation may certainly not know the possibility of single cell occurring by coincidence is 1 in 10950, in other words, impossible. 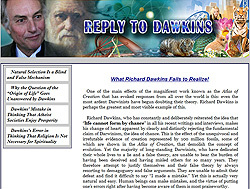 These people do not know that on the magnificently balanced planet we live , the probability of occurrence of changes, or a formation by coincidence is more than 101000, and occurrence of such a change is impossible.120 The same audience probably doesn't know greater possibilities should have taken place for the "miracle of life" and this includes even more statistical impossibilities. For this reason, to watch and believe this imaginary scenario is not so hard for people who do not have information in regard to the matter. - after the impossibility of the occurrence of the very first protein, the second, third, fourth and finally the one millionth, the same impossible coincidental occurrences are equally impossible. - the fairy tale of the emergence of the cell by coincidence in muddy water, which is even impossible to create under the control of scientists in laboratories, and is defined as "more complex than a galaxy" by scientists with its magnificent semi-permeable membrane. 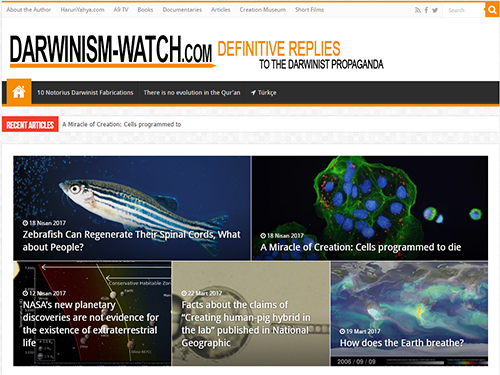 Darwinists frequently use the press for their propaganda and seek to deceive readers with visual conditioning. This is an extremely simple answer for someone and it doesn't require the necessity of research, or deep thought on the matter. Furthermore, the person doing the explaining is quite often a well-known and respected scientist. There is no need for the passive individual to consider, or make careful observation of the miraculous nature that we find in the protein structure. The person watching the documentary is left with the idea that a cell is nothing more than a bubble. The viewer is left with the impression that "it's very simple for a cell to have formed in a puddle of muddy water", as in the way mold forms in a glass of fruit juice left out for too long; the difference here, of course, is that molds, mildew, and fungi forms as a result of cellular bacteria. These are single-celled beings that form as the result of outside forces; the do not occur spontaneously, or form of their own volition, nor do they form by coincidence. Additionally, Darwinists don't bother to explain things such as the formation of the Earth, or how the early atmosphere of Earth would have killed the imaginary first cell, how protozoa turned into metazoa, and they gloss over the fact that bacteria had already existed; therefore, how could protozoa be the first life form on Earth? Indeed, each of these are points that cannot be explained with Darwinist pseudo-science, and can only be answered by "the origin of life" (in other words, Almighty Allah) which has brought Darwinism to its end. Darwinists can only tell fairy tales about how various species originated, and how the imaginary anthropoid creatures they conjure up were somehow the distant ancestors of all mankind. There are many people in the world who simply accept what they hear, read, or see without critical evaluation of the facts. Darwinists use this weak point, and fully exploit this tendency. Most people who fall into the Darwinist trap have these tendencies, and thus accept Darwinism, even if they don't see any scientific proof or reasonableness in the theory. For this reason, simple though illogical explanations on the part of the Darwinists over the last 150 years have deceived innumerable people, and brought a good part of the world under the sway of the system of the dajjal. That any scientist could come up with such an outlandish idea boggles the imagination. 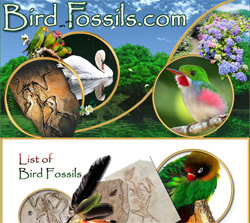 Every schoolchild knows that birds have an anatomical structure which supports flight, with appropriate organs, feathers, wings, a specialized respiratory system, and that birds absolutely did not come out of reptile eggs. Yet the adherents of the Darwinist ideology will put forward even the most laughable theories, and they know that when these theories are disproven, they will have to debase themselves. 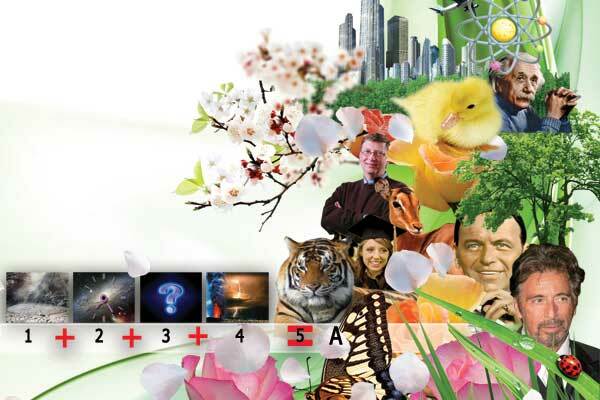 Nonetheless, for the Darwinists, all that matters is the unconditional defense of Darwinism. 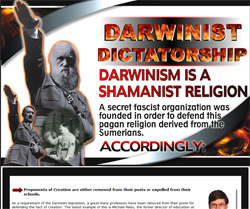 A secret agreement between Darwinist scientists has been developed in order to enhance the enchantment of Darwinism and to maximize its efficiency as a propaganda tool. With a handful of exceptions, almost everyone stays silent in regard to the illogical, inconsistent, and childish so-called explanations which have been developed in order to defend the Darwinian theory. The Ida hoax: The way that Darwinists tried to depict a fossil of a perfect, extinct lemur as evidence for the supposed evolution of man is a major indication of their hopelessness. 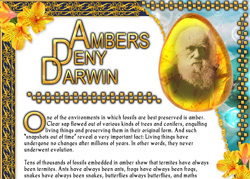 Darwinists have been forced to apologize in the wake of the embarrassing furore over Ida. Generally, the reactions of Darwinists to these frauds is quite feeble. According to their ideology, the simply must defend Darwinism, and its erroneous view that all life is "simple" no matter what; even though it is most obviously patently absurd. According to Darwin, evolution generated such things as black bears turning into whales, a claim which has no validity in any of the sciences. Nonetheless, the followers of Darwin will defend these false ideas to the very end. Darwinists produced a creature identical to the present-day Bonobo chimpanzee and gave it the name "Ardi." And then they said; "All right, it may be a chimpanzee, but it stands upright!" This is one rather primitive example of the Darwinist deception we know so well. 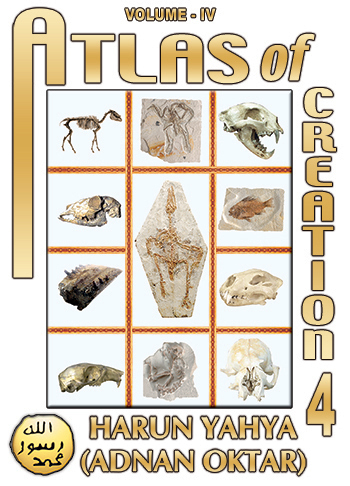 Discovered in 1994, the fossil skeleton was in a fragmented form when first found. The pelvic bone in particular was in tiny pieces and was exceedingly brittle the moment paleontologists picked it up. Darwinists took these minute pieces with no clear shape and reconstructed a pelvic bone just as they desired. "It's very difficult not to make them look like something you have in your mind if there's any chance of play… Ardi, requires a lot of guesswork." The inward-facing big toe on Ardi's feet and a foot bone absent from human beings are the most distinctive proofs that the creature did not walk upright. After examining the fossil, Jungers said, " "there is no way that they could belong to 'an animal that wasn't often walking on its hind legs' unless the data 'were deliberately ignored or if we had made them up'." "There are no apparent features sufficiently unique to warrant the exclusion of Ar. ramidus (Ardi) as being ancestral to Australopithecus." Darwinists' claims regarding Ardi are in fact significant evidence of the despairing situation in which they find themselves. Even if they fall into a hugely embarrassing situation, Darwinists have to repeat these feeble claims for the sake of their perverse Darwinist ideology.